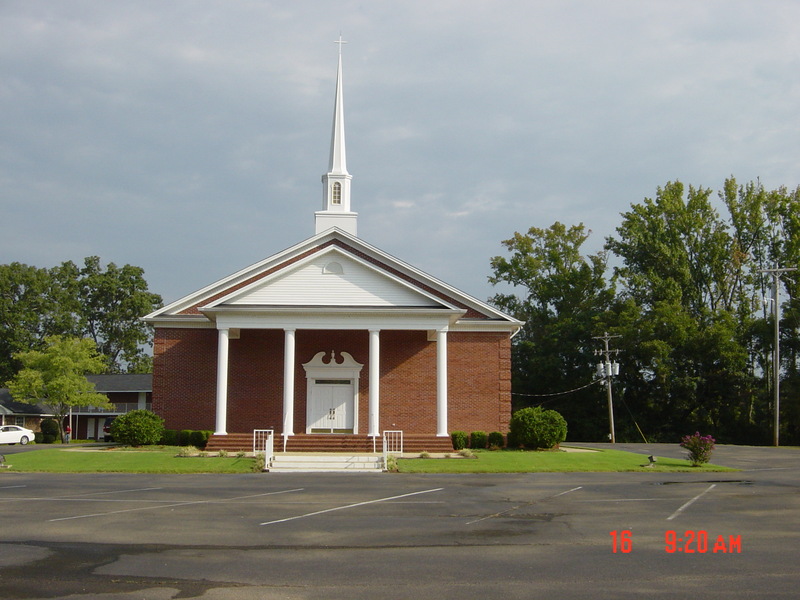 This was the building of the church my Dad pastors: Smithville Baptist Church in Smithville, Mississippi. 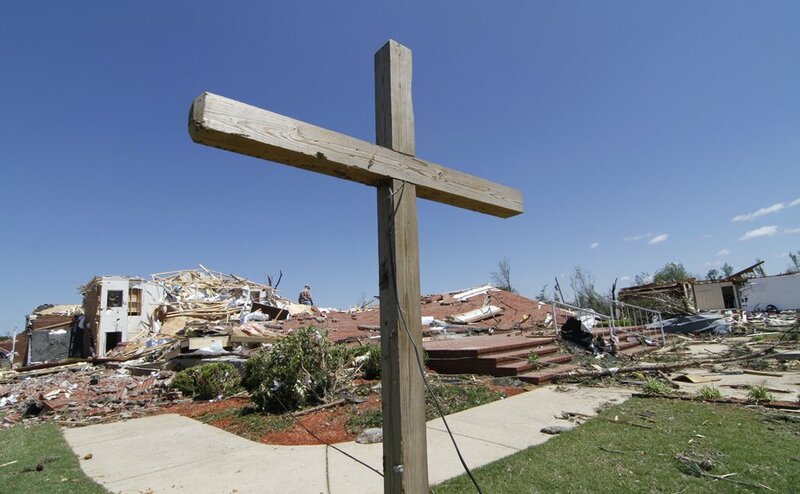 Yesterday, a maximum category F4 tornado demolished this small town of 1,000 people and destroyed this church. Please be in prayer for the people of Smithville. Dozens are dead and 11 more are missing as of the time of this post. Smithville has never seen a tragedy of this magnitude before. During the hurricane, my Dad, Wes White, was in the church building along with the Youth Pastor and several neighborhood kids. At the last second, they ran into the church basement and huddled together. 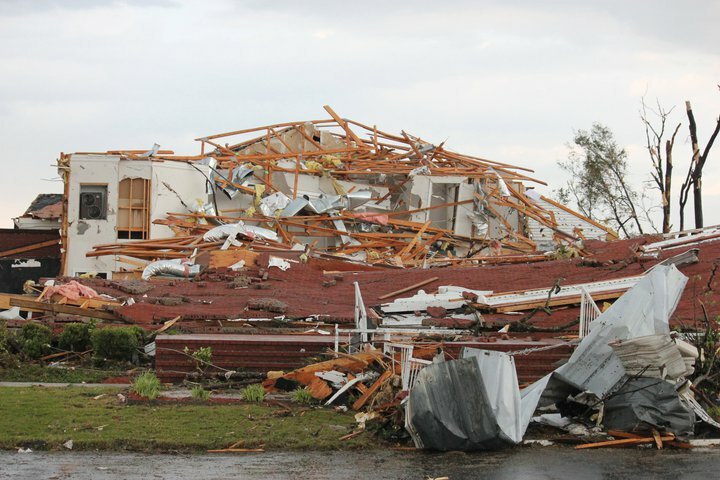 The massive tornado ripped the top floor off of the building, leaving the huddled group exposed to the storm. My Dad related the story to me over 24 hours later, still reeling and in awe. He told me of the air pressure which made his head feel like it was going to explode. 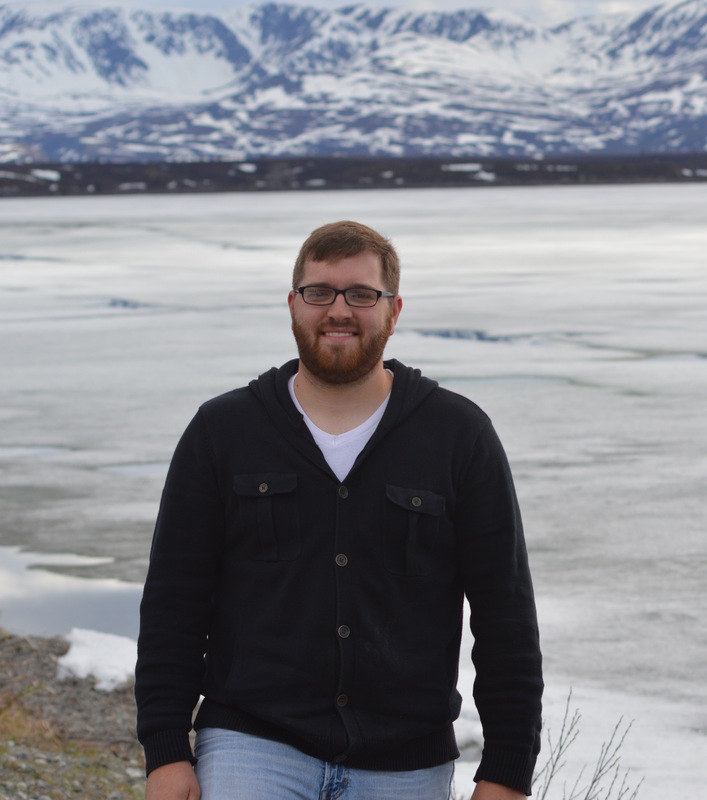 He told me of the bravery of Todd Summerford, the previously mentioned Youth Pastor, in gathering the children into the shelter. He described in graphic detail the horrible noise and the debris flying violently at them. With tears in his eyes, he described the sheer power of the tornado that featured 200 MPH winds. The group miraculously escaped without harm, with an incredible story to tell. Unfortunately, many Smithville residents were not so fortunate. 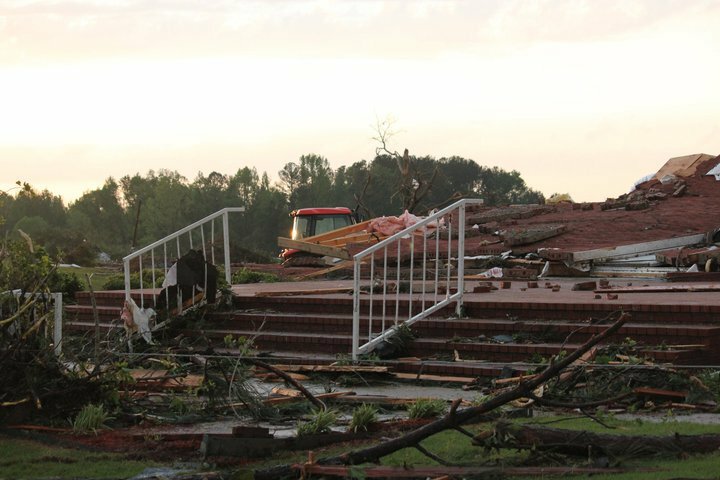 This tornado is proof that God is indeed gracious and good. He had every right and ability to take every life in this town, but he spared over 90% of the town, including my Dad and that group in the basement of the church. God is good. He is gracious. He is enormous. His love is staggering and His power is unfathomable. 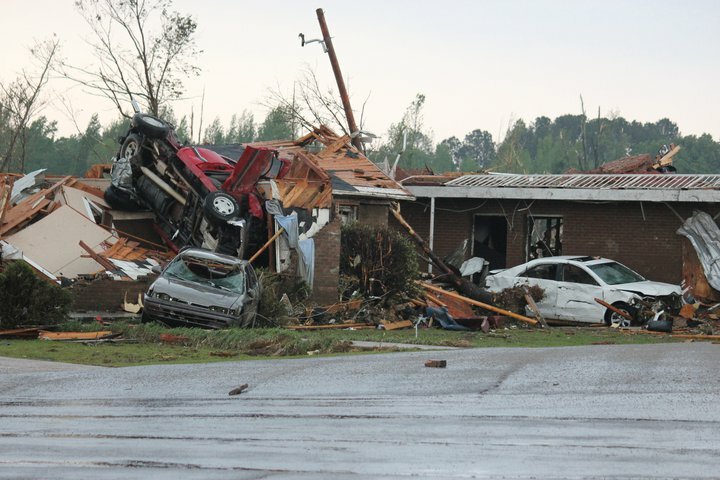 I heard the news of the devastating tornado yesterday afternoon, immediately after it happened. The next morning, Carmen and I loaded up and headed out toward Mississippi to offer any help we could and to be with my family in this horrible time. Over the course of our time here in Mississippi, I will be posting nightly updates on this website, along with pictures and prayer requests. Please view some of the pictures of the church below and understand just a little of what the town is going through. 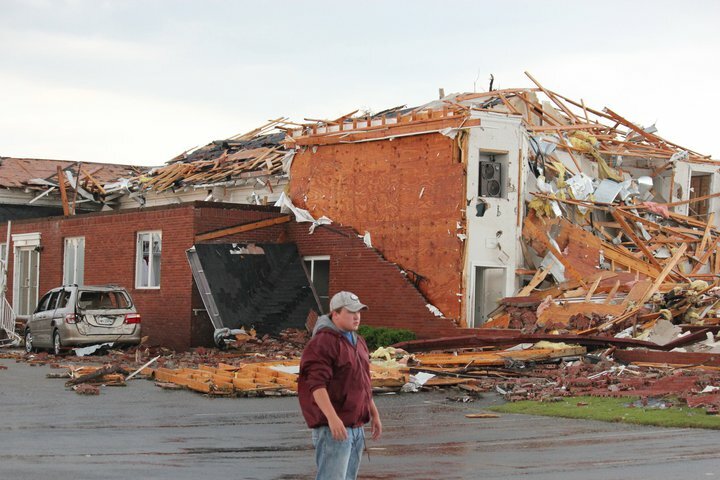 I will post more pictures of the town’s immense damage tomorrow evening. This is the front of the building. Only the steps remain. The flat part was the sanctuary. Right behind that car was where my Dad was during the tornado. The white car is my Dad's. It was thrown into the building. Our God is greater. Our God is stronger. Our God is higher than any other. Please, please, please, please keep praying and consider giving to support these wonderful people in Smithville, Mississippi. So awesome and wonderful to see God’s protection despite the tragedies going on in the south. Glad your family is safe, praying for the others. This is awesome to read even six years later. God is so good!